The recovery from Hurricane Sandy is going to require time, money and effort. And, like so many of the heroic rescues that happened during the storm, much of the effort is going to come from union members, and especially from the unionized public workers that the Republican Party has worked so hard to hurt over the past couple of years. Already we've seen fire fighters, police, EMTs, nurses and other health care workers saving lives. They've gone into flooded streets to rescue people, fought fires, carried patients down flight after flight of stairs to evacuate them. New York City fire fighters belong to the Uniformed Firefighters Association. Many of the health care workers carrying patients out of NYU Langone Medical Center as it was evacuated belong to SEIU1199. Now the hard work of getting back to normal has begun. Garbage collectors are out clearing debris from city streets. Bridges and tunnels are being inspected for safety. Railroad tracks and roads are being assessed and repaired. New York City buses will begin running again Tuesday afternoon, driven by unionized transit workers. Members of more than a dozen unions were involved in rescue or are involved in recovery. These union members are people whose jobs Mitt Romney, Paul Ryan and congressional Republicans would cut, whose pensions and benefits have been slashed by New Jersey Gov. Chris Christie, whose right to bargain has been under attack across the country. Make no mistake about it: The fact that these are union workers is important. Unions bargain for the tools their workers need to do the best job possible, from having enough workers on the job to having adequate equipment and training. The wage and benefits improvements union members get help keep workers on the job for longer, so that they develop the skills and experience to handle worst-case scenarios like the one we're seeing now. Having health care keeps them healthy enough to do physically taxing jobs like carrying patients down 17 flights of stairs. If someone you love was rescued from a flooded area, chances are it was a union member who rescued them. When your power goes back on, chances are a union member will have done the work. Mitt Romney will probably once again encourage you to embrace the line that we like workers, but just hate their unions. But the workers are the unions, and the collective power of unions helped individual workers rescue people or restore power or mobility by making sure they had the tools to get the job done and the pay and benefits such important work deserves. For more see the Daily Kos. Yesterday the University of Phoenix announced that it was closing 115 locations across the country, a move that will affect 13,000 students. Three of these campuses are located in Wisconsin. The Madison, Brookfield and Grand Chute campuses have stopped enrolling students and eventually will close. At this point the Milwaukee campus will remain open. The closures come as parent company Apollo Group Inc. said earlier this week that its fourth-quarter net income tumbled 60%, hurt by higher costs and declining enrollment at the University of Phoenix. . The University of Phoenix currently has about 328,000 students, down from a peak of more than 400,000. Following the closures, it will be left with 112 locations in 36 states, the District of Columbia and Puerto Rico. Shares in the Phoenix-based company tumbled nearly 8% in after-hours trading. It is also laying off about 800 employees out of a staff of 17,000, according to Mark Brenner, senior vice president for communications at the Apollo Group, which owns the university. After the closings, which are to be completed next year, the University of Phoenix will be left with a nationwide network of 112 locations and a physical presence in 36 states, the District of Columbia and Puerto Rico. Apollo stock closed Wednesday at $21.40, down $6.09, a 22 percent decline. Enrollments at the University of Phoenix and in the for-profit sector over all have been declining in the last two years, partly because of growing competition from other online providers, including nonprofit and public universities, and a steady drumroll of negative publicity about the sector’s recruiting abuses, low graduation rates and high default rates. Late last month, Kaplan Higher Education, a division of the Washington Post Company, announced that it was closing nine of its campuses and consolidating four others into nearby locations. The company did not give a reason, but in an August filing with the Securities and Exchange Commission it disclosed that an accrediting commission had warned that its campuses in Baltimore, Indianapolis and Dayton could lose their accreditation — and with it, eligibility for the federal student aid that makes up more than 80 percent of Kaplan’s revenues — for failure to meet student achievement requirements. “We’ve said publicly that about 20 percent of the students in our free three-week online orientation program either don’t complete the program or don’t enroll,” said Mr. Brenner. To help boost enrollment, the University of Phoenix last week announced a tuition freeze for students who remain consistently enrolled. Students affected by the University of Phoenix closings will have the option of transferring to the university’s online classes — about three-quarters of its students are online — or moving to a nearby site. Students are now being notified of the changes, and a hot line has been set up at (866) 992-3302 for those with questions. It has become an article of faith among Republicans that President Obama's polices caused the deficit to soar. As a result, they claim we need to cut federal programs that assist low and middle income families because it is immoral to leave these bills to our children. The problem is that it is just not true that the Recovery Act is responsible for the nation's projected deficits. According to the non-partisan Congressional Budget Office, the Recovery Act and even TARP (the bank bail-out) are not responsible for projected deficits. That is because these policies are short term. It's long term policies, like the high income Bush tax cuts, that stay in the system and remain unpaid for, that drive deficits. The Great Recession played a major role by reducing tax revenues and triggering automatic stabilizers, existing counter cyclical laws, like unemployment compensation and food stamps, that automatically increase federal spending during a downturn and then decrease spending during a recovery. 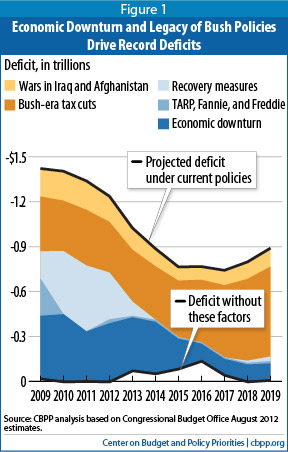 Check out the chart by the Center on Budget and Policy Priorities (CBPP) that illustrates that absent the Bush era tax cuts, the wars of choice in Iraq and Afghanistan and the downturn, there would be virtually no deficit. The entire CBPP report is linked here. In examining the student loan default rate data that the U.S. Department of Education recently released, it’s hard not to marvel at the success that Corinthian Colleges has had in driving down its schools’ two-year cohort default rates. The for-profit higher education corporation’s two-year rates have plunged across the board, with most of them dropping by double digits. For example, the company’s Everest College campus in Thornton, Colorado saw its rates plummet, from 27.3 percent in 2009 to 3.7 percent in 2010. How did Corinthian’s leaders achieve this remarkable feat? A. Radically improving the quality of the programs their schools offer to ensure that their graduates have the skills they need to obtain gainful employment in their fields of study? B. Slashing prices so that students don’t have to take on so much debt? C. Overhauling their schools’ recruiting practices to ensure that they enroll only students who they know can succeed in their programs? The correct answer is “none of the above.” Instead, as the Senate Committee on Health, Education, Labor and Pensions has documented, Corinthian officials have engaged in a no-holds-barred campaign to drive down their schools’ rates by pushing former students to obtain temporary forbearances and deferments on their loans. The company’s sole purpose has been to prevent these borrowers from going into default during the current two-year window when the Education Department holds schools responsible for their rates. As long as borrowers are in deferment or forbearance, they are not required to make payments on their loans and are not in danger of defaulting. Yet federal law mandates that the Education Department include such borrowers among those who are successfully repaying their loans in the default rate calculation. As a result, colleges can artificially lower their rates by persuading their former students to take advantage of these options. And while this may look like a win-win for both the company’s schools and their former students, that’s not the case for many of these borrowers. While putting federal student loans into forbearance allows borrowers to stop making payments temporarily, interest continues to accrue on the loans, ballooning the size of the overall debt load. The same goes for deferments on unsubsidized federal loans. Many of these borrowers could be better off making graduated or extended repayments, consolidating their loans, or entering into the Income Based Repayment Program, which would allow them to pay back their debt as a percentage of their income. Corinthian also built its own internal default-management operation, complete with a call center and dozens of employees. Documents show that the default-management operations at Corinthian are run with the same high-pressure sales environment as the recruiting department. Compensation is directly tied to the number of students an employee successfully eliminates from the company’s default rate. A numbers game, indeed. By pushing former students to get forbearances and deferments on their loans, Corinthian has been able to artificially lower its schools’ rates and make sure that these institutions continue to receive hundreds of millions of dollars in federal student aid funds each year. Reprinted from Higher Education Watch. Kaplan higher-education division will close nine campuses and consolidate four others into existing nearby locations, the company said in a Securities and Exchange Commission filing. The company, owned by the Washington Post, said it would stop new enrollments at the nine campuses it is closing, but that it would continue teaching the students currently enrolled there. Kaplan's decision comes only a month after Everest College announced that it would close its Milwaukee campus less than two years after it opened. Everest's job placement rate in Milwaukee was a dismal 5% and its drop out rate over 50%. Everest has agreed to pay off the federal loans of all of its Milwaukee students who dropped out without completing their program of study. Kaplan's parent company did not give a reason for its decision to close the campuses or identify them, but in an Aug. 7 SEC filing it disclosed that an accrediting commission had warned three campuses (in Baltimore, Indianapolis and Dayton, Ohio) that they could lose accreditation “for failure to meet certain student achievement threshold requirements” and had asked for the school to respond by September. The loss of accreditation would mean the Kaplan campuses would no longer be eligible for Title IV loans from the Education Department, the source of nearly 90 percent of Kaplan higher-education revenue. Kaplan was still a test-prep company when the Washington Post Company bought it in 1984, after Richard D. Simmons, the president, convinced Katharine Graham of its potential for expansion and profits. Over the last decade, Kaplan has moved aggressively into for-profit higher education, acquiring 75 small colleges and starting the huge online Kaplan University. Now, Kaplan higher education revenues eclipse not only the test-prep operations, but all the rest of the Washington Post Company’s operations. The Washington Post's Company chairman, Donald Graham, has emerged as the highest-profile defender of for-profit education. Together, Kaplan and the Post Company spent $350,000 on lobbying in the third quarter of 2010, more than any other higher-education company. And Mr. Graham has frequently gone to Capitol Hill to argue against the regulations in private visits with lawmakers, the first time he has lobbied directly on a federal issue in a dozen years. His newspaper, too, has editorialized against the regulations. Four whistle-blower suits against Kaplan under the federal False Claims Act have been made public in the last few years, all making accusations that the company used deceptive practices in its quest for profits, including enrolling unqualified students and paying recruiters for each student enrolled, a practice forbidden by federal law. In addition, the suits allege, Kaplan kept students on the books after they dropped out, inflated students’ grades and manipulated placement data to continue receiving financial aid. Three of the suits, from Pittsburgh, Milwaukee and Miami, have been consolidated for trial in Miami. A fourth, from Las Vegas, is pending there. The company said revenue at the campuses to be closed represent approximately 4 percent of total revenue for Kaplan higher education and 2 percent of the total Kaplan division, which includes other educational operations. The Post Co. said Kaplan expects to incur an estimated $18 million in restructuring costs, a portion of which would be recorded in third-quarter earnings, with the remainder recorded through the end of 2013. Kaplan has about 70 campuses, and about a third of the division’s 67,605 students as of June 30 were on Kaplan ­higher-education campuses, with most of the rest of them studying through online programs. Ryan's speech: ducked the tough issues and blamed others for the problems. The reasons for that are clear: Details are a turn-off, at a boisterous convention or apparently in a full campaign. A New York Times poll last week showed that the Medicare plan advocated by Mr. Ryan and Mitt Romney was highly unpopular in the swing states of Florida, Ohio and Wisconsin. As soon as voters find out that the Republicans plan to offer retirees a fixed amount, they disapprove, clearly preferring the existing system. The Romney campaign knows this, of course, so it has developed a counterstrategy that was fully on display at the convention for those who might have missed it on the trail: Don’t change the plans, but don’t talk about them, either. Instead, invent a phony attack on President Obama’s policies, which are public in full detail, and hope that voters get so confused that they throw up their hands and cast their vote on some other issue or on emotion. The tactic was on display on Wednesday when Senator Marco Rubio of Florida solemnly told CBS News that Medicare will have to look different for a new generation. “Anyone who’s in favor of leaving it the way it is now is in favor of bankrupting it,” he said. Yet Mr. Ryan tried to frighten beneficiaries that evening by denouncing Mr. Obama for cutting $716 billion out of Medicare to pay for health care reform. He didn’t say that the money would come out of hospitals and insurance companies, not benefits, and that he proposed exactly the same cut. He didn’t say that reform provides popular benefits to retirees, like the end of the prescription doughnut hole and improved preventive care. But the effect is clear: voters say in surveys that while they don’t like a Medicare voucher program, they don’t necessarily associate that with the Romney/Ryan ticket and are no less angry with Mr. Obama for his Medicare cuts. So far, the Democratic critique of Mr. Ryan’s plans has not substantially changed a very close race. Mr. Ryan said he wouldn’t blame others, but the message was lost at a convention where the Senate minority leader, Mitch McConnell, tore into Mr. Obama for spending too much time on his golf game and discussing his food preferences. Did Mr. McConnell realize others were listening when he said that the country doesn’t know how the president would deal with the coming expiration of the Bush tax cuts? Mr. Obama has been explicitly clear about his plans: preserve the cuts for the middle class but not for the rich. Not mentioning that fact, and pretending that there is some doubt about it, is central to the Republican Party strategy of inventing an alternate reality. Republicans also aren’t mentioning that their proposal to eliminate federal control of the Medicaid program for the poor would not only damage the health care of millions of struggling Americans but would also affect middle-class families who have relied on the program to pay for nursing home care. The Romney/Ryan plan would eliminate the protection that keeps a married couple from impoverishing itself to qualify for nursing home coverage. The party platform mentions a few Medicaid details, but not a word of the real plan has been uttered at the convention microphone. The best way to duck the tough issues, apparently, is simply to claim very loudly that you are doing the opposite. Among the industry’s principal givers are the Apollo Group (parent company of the University of Phoenix), which has contributed $259,901 to candidates; APSCU, which has given $184,500; and DeVry, Westwood College, Argosy and Art Institutes parent Education Management Corporation, and Everest parent Corinthian Colleges. The Art Institute and Everest have recently established operations in Milwaukee. The for-profits have contributed to Republican presidential hopeful Mitt Romney and nothing to Barack Obama, whose administration has been largely seen as cracking down on them.